This chicken dish will have wonderful smells coming from your oven—especially welcoming on a chilly night. Serve it over sturdy greens to make a warm salad along with Basic Cauliflower Mash to which you have added goat’s cheese. With a sharp heavy knife, split the chicken down the backbone and open it up. Turn it breast side up and flatten with the palm of your hand. Cut a slit in the skin at the bottom of the breast and slip the “ankles” of the chicken through the slit. Sprinkle liberally with salt and pepper. Transfer the chicken, breast side down, to a lightly oiled roasting pan. Bake for 45 minutes. 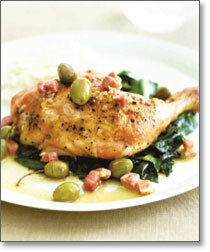 While the chicken is baking, prepare and combine the prosciutto, shallots, garlic, and olives. Remove the chicken from the pan. Either carve the chicken or cut into serving pieces. Pour the prosciutto mixture over the chicken and serve.